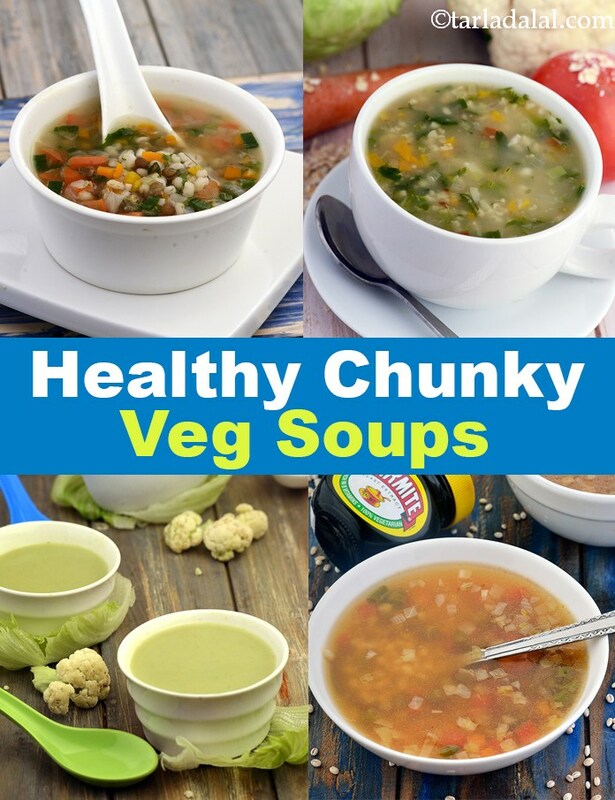 Healthy Chunky Soup Recipes, Healthy Indian Veg Broth Recipes. Chunky Soups and broths feature loads of crunchy and juicy veggies, in a base of vegetable stock or water. These give ample nourishment to your body while ensuring weight loss. Having such healthy chunky soups once or twice a week in the place of a meal helps to get a flat tummy. Soups with high water content also help to maintain the fluid balance of our body, thus ensuring normal blood pressure. Toss in some sprouts, pulses or millets along with the veggies, to get more crunch and some protein and calcium as well in these veg broth soups. This will also keep you full for longer hours. See why oats are good in healthy chunky soups. Oats are a great source of protein for Vegetarians. It is rich in soluble fibre, which helps lower blood LDL cholesterol, the so-called "Bad" cholesterol. Whole Oats have an antioxidant called Avenanthramide (a polyphenol from oats) which helps lower blood pressure levels. The oats and vegetable broth recipe is made of carrots, cabbage, cauliflower, tomatoes which add good bulk to the oats based soup. Another super option is minty vegetable oats soup recipe which used a vegetable stock and mint leaves. See why barley are good in healthy chunky soups. Barley is diabetic and pregnancy friendly. A high fiber diet for years has been paired with reduced risk of heart disease. The fiber (2.73 g) from barley helps reduce blood cholesterol levels. Additionally folate, potassium and magnesium also work together to support a healthy heart. A good vegan soup with barely to have is the mushroom barley soup recipe which also has a vegetable stock making the recipe super tasty. My favourite is the nourishing barley soup recipe made with spring onions, carrots, tomatoes and always tends to soothe the body when you feel a bit unwell. Use the pressure cooker with vegetables and yeast marmite to give a delightful Vegetable Broth with Yeast Marmite. Apart from the vegetable and yeast extract, marmite is made with Niacin, Folic Acid and Vitamins like B1, B2 and B12. Rolled oats is another ingredient rich in fiber and can help you make a thick soup. Empty your refrigerator to make a sumptuous bowl of super chunky green peas cauliflower carrot soup or Milano Minestrone with a myriad of vegetables and minimum condiments. Apart from the Healthy Soup Recipe given below, here is an article on top Indian 10 soups you will enjoy. If you enjoyed Healthy Chunky Soup Recipe articles you will enjoy the below 5 soup articles.